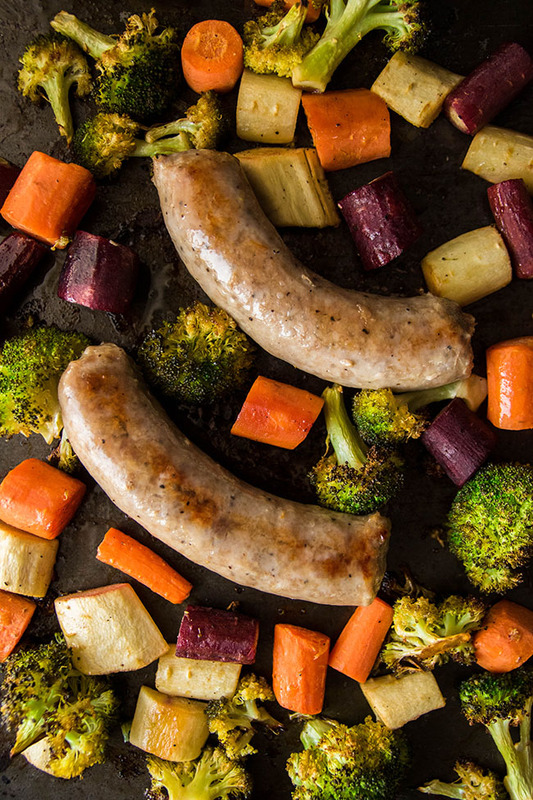 This easy one pan sausage bake will be your new favorite sausage dinner recipe! 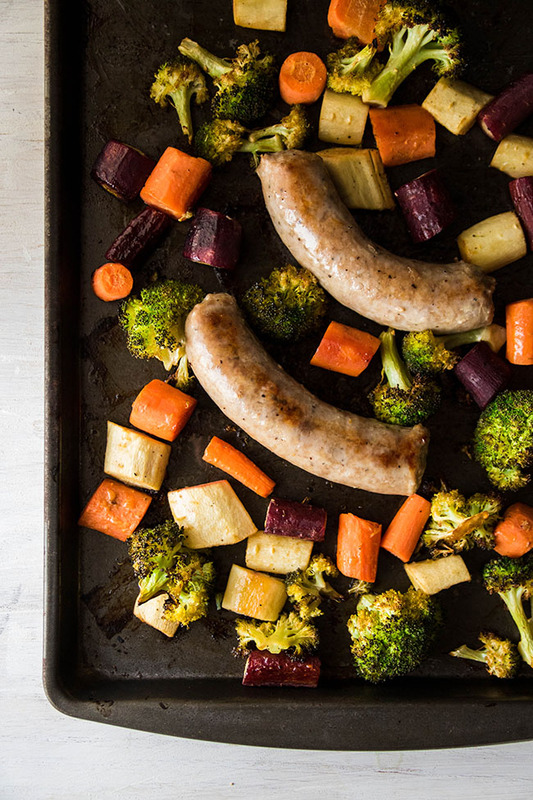 Polish sausage, carrots, parsnips and broccoli make an easy sheet pan supper that’s sure to please. Soooooo…sheet pan dinners. Let’s talk for a minute about how delightful it is to just throw a bunch of things on a pan, bake it up, and then BAM! Food. 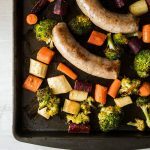 Easy peasy one pan dinner recipes have been my jam lately – especially this one pan sausage bake because OMG – as I gear up for a busy travel season. I’m headed to Louisville and Boston this month (side note: leave me a comment if you have any restaurant recommendations in those cities because I will be eating ALL OF THE THINGS) and am busy working ahead on a few projects so I don’t have to check in with everyday work things too much while I’m gone. Busy work times + upcoming travel craziness = healthy, simple, FAST dinners are 10000% necessary in my house this week. I love this recipe because it’s simple but full of flavor – perfect for a quick weeknight dinner when I have to get back to work and packing and laundry and adult-y things (boo). Just whisk together a quick sauce for the veggies, throw everything on a pan, and call it good. This recipe is also easy to customize – just switch out the produce for whatever’s in season (or whatever you happen to have in your fridge!) You could also switch up the sausage variety in this sheet pan dinner, or even swap it out for some wild salmon or chicken breasts. The sauce is the real star here – it’s my go-to dressing anytime I roast vegetables. There’s a bit of acid, a bit of sweetness, and some nice depth from a splash of Worcestershire sauce. Add parmesan cheese or garlic to the sauce if you want to liven up the veggies even more, or keep it simple for a quick and easy dinner. An easy one pan dinner for busy weeknights. In a large bowl, whisk together all dressing ingredients. Set aside. Peel parsnips and carrots and trim the ends off. Cut into large pieces that are roughly the same size as your broccoli florets. You want all the veggies to be the same size so that they cook evenly! Add chopped parsnips, carrots, and broccoli to the dressing you made in step 2. Toss until veggies are lightly coated. Drizzle olive oil over a large baking sheet. 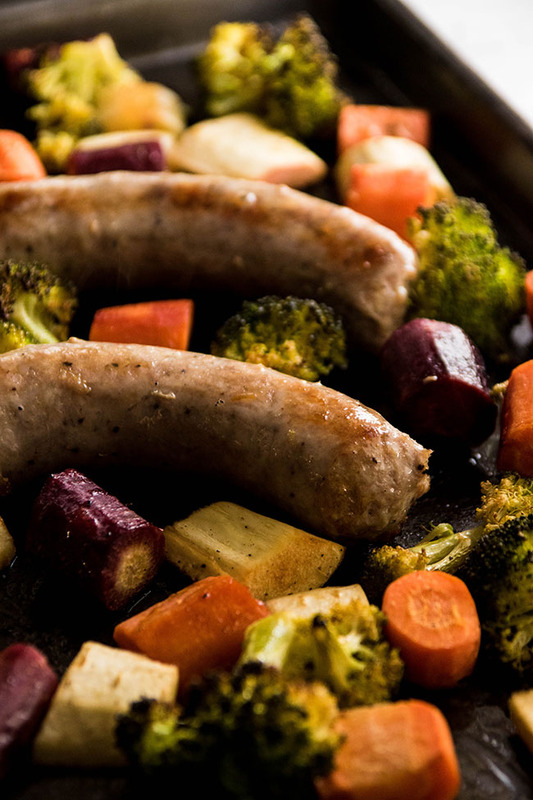 Lay Polish sausages and dressed veggies on the baking sheet in a single layer. Bake at 425 degrees F for 20-30 minutes until sausage is cooked through and veggies are roasted. Serve immediately. Use whatever seasonal veggies you have on hand for this recipe. Swap the Polish sausage out for other proteins like shrimp, chicken, salmon, or chicken sausage. If you use an alternate protein, you may need to adjust the cooking time.